Beautiful, personalised acknowledgement cards for you to give family and friends as a way of thanking them for the support they have been to you through your heart-breaking journey. 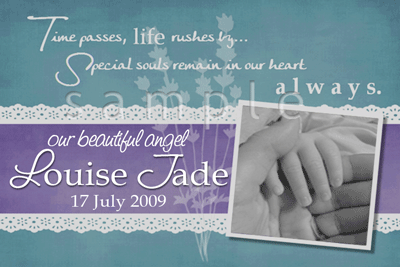 Alternatively, just order one or two as a treasured keepsake card of your precious angel. Frame it or put in your baby's memory box. Each acknowledgement card / keepsake card is custom designed for you only... we do not use templates (however if you decide you'd like something similar to one of the samples shown, that's ok too). Just tell us what you'd like and let us take care of the rest.